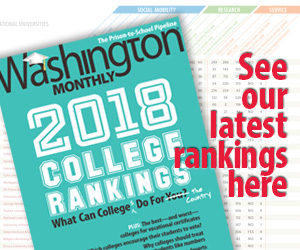 Washington Monthly | Adult Education, Crucial or Expendable? Adult Education, Crucial or Expendable? President Barack Obama’s goal to increase the number of two- or four-year degree holding Americans by 2020 will require significant investments in educating nontraditional-aged college students, a U.S. Education Department assistant secretary Wednesday told TRIO program administrators at the Council for Opportunity in Education’s annual seminar with the Education Department in Washington. Then again, money was also crucial to achieving the president’s vision. The importance of helping adults achieve a college education may be an academic discussion at this point. Obama’s goal build a country with the highest college graduation rate in the world by 2020 was a part of his American Graduation Initiative, which is no longer really happening. The American Graduation Initiative, for instance, was supposed to provide $12 for community colleges. In the actual budget, they got $2 billion. That’s not much money to get many more people, whether adult learners or traditional college students, through school.